The French manufacturer of motorcycle helmets Shark proposes you his double homologation flip up moto helmet with intergrated sun visor the Evoline 3 Solid Matt. Flip up helmet built in high-strength injected Thermoplastic with chin strap that folds to the back of the helmet. Auto-up system that allows simultaneous unlocking of the visor and the chin strap during handling. 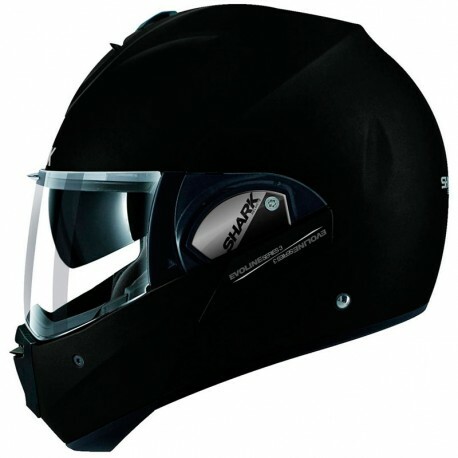 Anti-fog and anti-scratch visor equipped with quick and easy disassembly system. Inside solar screen labeled UV380 and anti-scratch treated. 100% removable and washable interior made of natural bamboo fiber antibacterial, anti-sweat and hypoallergenic. Shark Easy Fit: passage for glasses.